On Saturday, May 10th the Mystic Krewe will be hosting an IFPA-sanctioned tournament, from 4pm ’til at our famous PinChurch. PINGOLF is a fun, new way for people to compete individually and play in teams, encouraging more-skilled players to help those new to the sport. 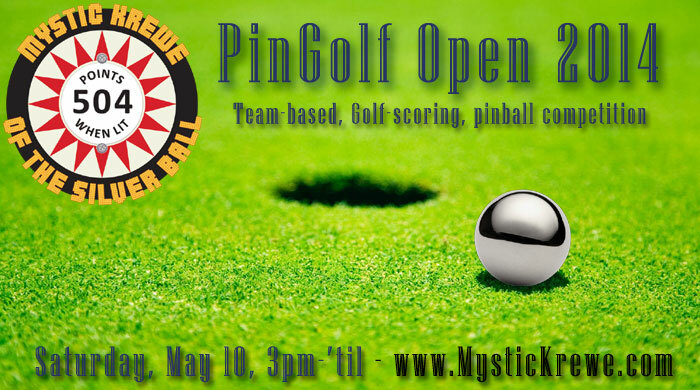 We will play a round of 9 “holes” of golf on 9 different pinball machines, each with its own objective, and the players who reach each machine objective in the lowest number of balls played, will record the better scores. The team with the best overall (low stroke) score will win the team competition, and the top 8 individuals will compete for the top individual champion slot. Prizes and cash will be awarded both in team and individual play. Doors open at 3pm. Tournament starts at 5pm. BYOB.. Bring snacks and food and share with everybody else. If you are not a member of the Mystic Krewe, contact us for details and directions if you would like to participate. We will allow a limited number of non-members to compete in the tournament if they pre-register. Competitors may bring guests to the event with prior permission if they will donate to help cover maintenance of the machines ($20/person). There will be over 40 pinball machines available for free play. NOTE: All participants must pre-register! Teams will be assigned ahead of time based on player rankings so we need everyone to be signed up by May 8th! NOTICE: We already have 20 competitors signed up (5 teams). Registration is now closed. It may be possible we allow more people to compete but only if we have 4 more players to complete a team. If you are interested, use the “contact us” form on this site. If you can complete an entire team yourself, let us know – we may be able to accommodate you. Registration is $30 per person for non-club-members. Groups will be set up by IFPA seed with top-ranked players grouped with lower-ranked players. Un-ranked players will be randomly seeded. Game objectives will vary from game to game. It will usually be a certain score, but sometimes it can be achieving a certain objective in the game (i.e. starting multi-ball or a certain mode). When a target score/objective is reached, the player will stop playing and record the number of strokes (balls) – any remaining balls in the game will be skipped/plunged/passed. There is a course maximum of 7 Pin-Strokes per Pin-Hole. Should you not reach the Target Score after playing six balls, record a score of 7 and move on to the next Pin-Hole. It may take multiple games to reach the Target Score/objective. In this case, any additional games played will be added to the score accumulated from previous games. Extra Balls are NOT counted: If a player earns an extra ball, this will be counted as an additional Pin-Stroke if needed. Player delays- Since this is a one day tournament we need to keep things moving. Please stay close to the tournament area during rounds. Any player that is not at the game when it is their turn will have their ball plunged after 3 minutes which will count as a stroke. Pin-Strokes on that Pin-Hole. Please keep things moving by stopping play once target score achieved and letting the other players play their balls. The player with the lowest score at a Pin-Hole takes the honor of playing first on the following Pin-Hole. The competitor with the second lowest score plays next and so on. If two or more competitors have the same score at a Pin-Hole, the play in the same order as the previous Pin-Hole. Anyone caught cheating will be bounced from the Tourney. Everyone is expected to be on their best behavior. Tilting someone elses ball will result in a one stroke penalty for the offender. The player whose ball was tilted will wait until their turn is up again and play with 1 stroke subtracted from their score. A player playing someone else’s ball will result in a 1-stroke penalty. BE SURE it’s your turn when you step up to play. Slam tilting a game in progress will result in a 3 stroke penalty. A second offense will result in a disqualification from the tournament. Bang backs and death saves are not allowed.IFPA rankings will be submitted individually, but awards will be given based on team play. The group with the lowest number of strokes for the round will be awarded first place, second place for the next lowest, etc.An additional prize will be awarded for the winners from the top 8 competitors who will compete amongst themselves in a second round of PinGolf with higher thresholds.